I first learned the term iatrogenic disease back when I was in pre-med. I was working at a University teaching hospital as a Respiratory Therapist to help defray college costs. All too often, I noticed that patients were getting drugs that were contraindicated for the condition described on their chart. I remember quite clearly one particular instance when the doctor’s orders were for the administration via nebulizer of a drug that carried an explicit warning against use on the patient I was about to treat. Looking around for the floor nurse to get some clarification, I couldn’t find anyone. It was about 8 o’clock in the evening, so they were all busy. Feeling a grave responsibility to “cause no harm,” I ferreted out the attending doc’s home phone number at the floor desk. I picked up the phone and dialed. A brief conversation ended tersely when the doctor, apparently angered by my interrupting his evening, said, “Who is this again?” Then barked, “Let me speak to the floor nurse immediately.” After the nurse repeated into the phone, “Yes, sir. Uh-huh. Yes. Yes, doctor,” several times, she quietly hung up the phone and with the faintest smile turned to me and said, “Doctor says to substitute normal saline for the Isuprel. Oh, and he also said not to ever disturb him at home again,” as her smile broadened. When a doctor or a medical treatment actually causes disease or death, it is called iatrogenic. I learned that word that night. “We’re Number…15?” What was (maybe) true at one point in time, isn’t true anymore. As recently as 2012, national politicians (John Boehner, et al.) were claiming that the U.S. has “the finest health care system in the world.” In fact, that was a common talking point for politicos for decades. But you hardly hear anyone making that specious claim these days. It may never have been true and one thing is certain, Americans are wising up. Part of that is because of the Information Age. About 15 years ago, five doctors published a lengthy paper based on metadata they had studied about medical treatments, outcomes and causes of death. What they exposed was the poorly kept secret that American medicine has grown so invasive, so violent and radical that if it were listed in the Center for Disease Control’s annual report on Leading Causes of Death, American medical treatment would rank number one, ahead of cancer and heart disease. As recently as spring of 2016, both the Journal of the American Medical Association and the British Medical Journal published articles that generously ranked only medical errors as the third leading cause. Note: Medical errors are but a subset of iatrogenic disease. Some properly performed, correctly prescribed medical treatments result in and cause death also. Those aren’t errors, per se, but are still iatrogenic death sentences. By tirelessly collecting and publishing data from various research, Gary Null, Ph.D., Carolyn Dean, M.D., N.D.; Martin Feldman, M.D. ; Debora Rasio, M.D. ; and Dorothy Smith, Ph.D. published Death by Medicine. It has now become a documentary and a book. And all of it has opened the eyes of millions of Americans to what we already were suspecting: one of the most dangerous things you can do is place your health in the hands of American medicine. Bandaids for Bullet Wounds. There is absolutely no doubt that American emergency room docs and nurses are miracle workers. Stationed on the frontline of care and in the trenches of triage, when it comes to emergent care of trauma and acute symptoms, no place in the world can work the wonders that an American ER can. And some of the technology that can pull a patient through in the ICU is indeed remarkable. But those are the rare cases of extreme measures. Most of our visits to doctors, pharmacies and hospitals are more on the less dramatic side, though indeed, sometimes very serious. Those medical protocols for chronic, systemic and non-emergency diseases are wherein lie the greatest risks. From the data published 15 years ago (and it’s only gotten worse), 106,000 patients yearly are killed by adverse drug reactions (ADR) even when prescribed and administered correctly. 115,000 die from medically acquired bedsores. 32,000 die during surgery. And 37,000 die annually from unnecessary procedures. Add in the various other medically caused deaths and you get a whopping total of 999,936 a year. These numbers all come from published research and make medical treatments the leading cause of death in the United States. Even though the CDC lists falls from ladders they ignore the million who die from medical treatment. Affordable Care or Too Big to Fail? Politics aside, please, the financial bottom line is that, in 2003 dollars, the cost of these deaths by medicine amount to nearly half a trillion dollars a year. It’s got to be much more now. 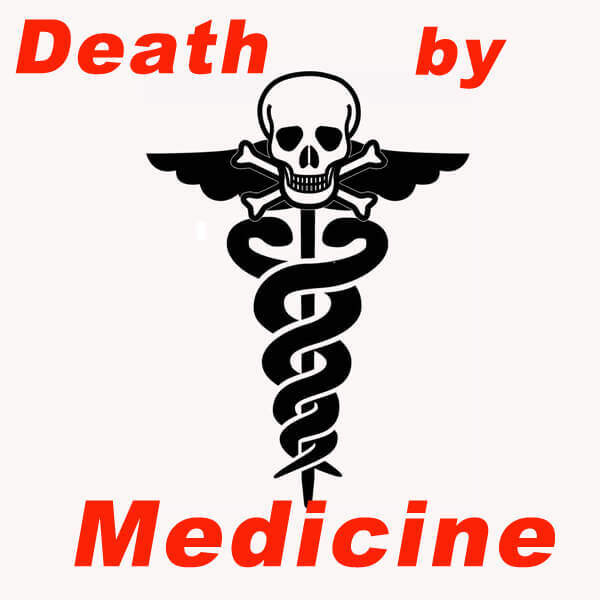 Since the groundbreaking publication of Death by Medicine, several followup studies by numerous researchers have confirmed and itemized the various problems with American medicine. Hospital-acquired infections are becoming an epidemic. Complications after elective surgeries are killing people. And who doesn’t know someone who has either been injured or died from medical treatment? The system is broken. It needs a major overhaul and may have to be rebuilt from the ground up. American healthcare has become a financial behemoth. Just look at how recession-proof it was following the crash of 2008. While most businesses were contracting and laying off, corporate hospitals were snatching up real estate and building multibillion-dollar expansions. The Affordable Care Act mandates that more and more people be made available to the for-profit medical system in the United States that lags behind nearly every other modern nation in medical outcomes but ranks at the top of the list as a cause of death. Tough choices ahead.